Articles about foods and recipes, monte carlo sandwitches, roast chicken, chicken wraps, freezing potatoes, italian french soda party and so on. I was watching the news last night and found him tanlkig to the journalists again, complaining and complaining.I just find he is those sort of people who can be never happy. 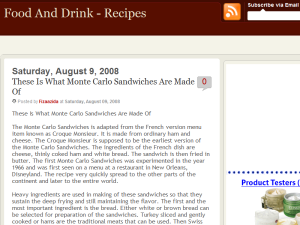 This what your Food n Drink - Recipes Blog Ad will look like to visitors! Of course you will want to use keywords and ad targeting to get the most out of your ad campaign! So purchase an ad space today before there all gone! If you are the owner of Food n Drink - Recipes, or someone who enjoys this blog why not upgrade it to a Featured Listing or Permanent Listing?